Earlier this month, EPI released its annual “Class of 2014” paper, which examines labor market trends for recent high school and college graduates. Among other trends, authors Heidi Shierholz, Alyssa Davis and Will Kimball highlight the problems recent graduates face when they graduate with high levels of student debt. Student debt continues to be one of the biggest reasons young people postpone major purchases like cars and houses, and repayment can be difficult if students can’t secure their first job after graduation. Congress’s past failures to keep interest rates on student debt low, let alone provide a comprehensive refinancing plan (although that could change with Senator Warren’s new bill), should be cause for concern for recent college graduates. President Obama’s 2015 budget proposal, released in March, makes college affordability a priority by broadening the scope of the Pay as You Earn (PAYE) repayment program to all student borrowers. Currently, for qualifying students, PAYE allows high-debt, low-income students to pay a lower monthly payment (10 percent of their income) than the standard 10-year repayment plan requires, and provides total loan forgiveness to graduates after 20 years of qualifying repayments. The administration proposed expanding the program to all students beginning July 2015 and making it the only income based repayment option, providing access to affordable repayment options for all student s and simplifying the repayment experience. While additional reforms proposed to PAYE (page 13 here) seem common sense (eliminating caps for high-income borrowers and calculating payments for married couples using combined household adjusted gross income instead of calculating payments separately), part of the budgetary cost of this expansion is recouped by capping loan forgiveness on a subset of the PAYE repayment program, graduates enrolled in the Federal Public Service Loan Forgiveness program (PSLF). If I told you that the legislature of State X is going to make it easier for workers in the state, including public employees, to earn overtime pay, you might wonder what effect that would have on employment in the state. What if the cost to employers from having to pay more workers time and a half for overtime is so high that it causes businesses to move to a neighboring state that has a weaker requirement? Or what if it raises costs and employers respond by laying off employees? Those fears are being raised by groups like the National Retail Federation, the Heritage Foundation, and the CATO Institute, all of which oppose President Obama’s plan to revise the Fair Labor Standards Act regulations that govern the right to overtime pay. The president wants to make it easier for relatively low-paid employees to earn overtime pay when they work more than forty hours in a week, but the conservative business lobbyists are already yelling about job loss—with no real explanation or evidence that job loss is a realistic outcome. Fortunately, California provides a kind of natural experiment about what happens when more workers have a right to overtime pay, and the results are reassuring. Regardless of their job duties, California law guarantees overtime pay to employees earning less than $640 per week, while its neighboring states—Arizona, Nevada, and Oregon—only guarantee overtime pay to workers paid less than $455 per week, less than a poverty level wage for a family of four. Other rules in California make it harder for employers to deny overtime pay to even better paid workers whose jobs include duties that could be considered managerial or professional. In California, but not in its neighboring states, an employee has to spend a majority of his time doing managerial or professional work in order to be excluded from the right to receive overtime pay. However, by failing to consider the effects of China’s purchases of foreign exchange reserves and its significant trade surplus, the Kessler-Subramanian model appears fatally flawed. China invested more than half a trillion dollars in purchasing foreign exchange reserves in 2013 alone—a new record. But for those purchases, the value of the RMB would have been significantly higher. Kessler and Subramanian claim that the RMB was “only slightly undervalued in 2011” is simply not credible, when that exchange rate is being sustained with such massive purchases of foreign exchange reserves. In fact, China’s currency needs to rise in value every year because productivity growth in manufacturing is so much higher than in the United States and other countries. Between 1995 and 2009, China experienced manufacturing productivity growth that ranged between 6.7 percent and 9.6 percent per year. Over the same period, productivity growth in U.S. manufacturing averaged only 2.4 percent per year. Thus, China must allow its currency to rise by four to seven percent a year simply to keep its trade surplus from expanding. Earlier this month, we released our “Class of 2014” report on the labor market and earnings prospects for the high school and college graduates of 2014. In short, things don’t look great. The prolonged slack in labor demand—unemployment for college graduates is 8.5 percent compared to their 2007 levels of 5.5 percent—has depressed earnings for the majority of recent graduates. To make matters worse, student loan debt reached an all-time high of about $1.2 trillion. Coupled with young college graduates’ stagnant wages, student debt poses an obstacle to graduates seeking financial security. The figure below shows the real average hourly wages of young college graduates (ages 21-24) by gender. Inflation-adjusted hourly wages fell by 6.9 percent for college graduates since 2007, which means full-time, year-round workers are earning $2,600 less in total annual wages. What’s more, the downturn has only exacerbated the wage stagnation young college graduates were already experiencing. Wages for all college graduates fell 0.9 percent between 2000 and 2007, from $18.41 in 2000 to $18.24 in 2007. Female college graduates saw their wages decline by 4.6 percent over that time period ($17.82 to $17.00). Male college graduates did experience a 3.7 percent increase in hourly wages from 2000 to 2007, but those mild gains were quickly erased by the Great Recession. College graduates simply did not see any signs of consistent wage growth prior to the Great Recession. Clearly, it is not necessarily the case that as long as you obtain a college degree, you’ll be gainfully employed and well compensated. The class of 2014—most of whom started college after the Great Recession was officially over—likely figured that by the time they graduated the labor market would have recovered to the point that their job prospects and future earnings would make their student debt manageable. Sadly, this has not been the case, and the effects will likely be long lasting. A new policy guide from the Broader, Bolder Approach to Education (BBA) and the Schott Foundation’s Opportunity to Learn Campaign shows how to build high-quality early support systems for children that strengthen communities and families, promote and sustain early education, and enable children to thrive. It also covers ways to resolve one of our nation’s most intractable problems: the academic achievement gap. We know that children arrive at kindergarten with already large gaps that divide them along lines of race, ethnicity, and social class. We know, too, that these gaps prove stubbornly difficult to close, and that they are very often widened by disparities in access to appropriately credentialed teachers, small classes, school resources, health care, nutritious meals, and other related factors. The Economic Policy Institute, where BBA is housed, has been a leader not only in documenting these gaps, but in producing research showing how to narrow them before they get so hard to tackle. For example, in 2007, EPI calculated the economic and social benefits of investing in a voluntary, high-quality publicly funded prekindergarten program that would narrow gaps by helping disadvantaged students achieve their full potential. Seven years later, this is a cornerstone of President Obama’s proposal for early childhood investments, and of the Strong Start for America’s Children Act bills proposed by leaders in both houses of Congress. The Supreme Court is expected to decide Harris v. Quinn, a case of major importance for American workers, in the next few days. Many observers predict a disastrous decision that will cripple union organizing and collective bargaining for home health aides, child care workers, and other direct care aides. But the Court could go much further and threaten the ability of all public employees to form unions and bargain collectively with any state or local government. The case involves the ability of public employees to bargain for a provision in their contracts (known as an agency fee) requiring every covered worker to pay his or her fair share of the cost of maintaining the union, negotiating a contract, and enforcing its provisions. A majority of states allow such provisions, but so-called right-to-work states do not. Why is this so important? Wages in most occupations have stagnated or fallen since 2000, even as profits have climbed to historic heights and inequality has worsened. The erosion of the minimum wage, rising CEO pay, and many other factors have played a role, but the decline of unions is near the top in importance. Business and conservative groups have lobbied around the nation to impose right-to-work as a way to weaken unions and keep wages low. It’s a successful strategy: research shows that workers in right-to-work states are paid $1,500 a year less, on average, than employees where unions are free to bargain for agency fees. Negotiating and administering union contracts, organizing employees, and winning elections is expensive, especially when outside groups and politicians mount well-funded opposition campaigns, as recently occurred at Volkswagen in Chattanooga, TN. Right-to-work laws allow employees to get the benefits of union contracts without paying their fair share, drying up a key source of the funds unions need to survive. I was saddened to learn that Harry Clay Ballantyne, who led the Office of the Actuary at the Social Security Administration, recently passed away. Harry was an exemplary civil servant and private citizen. Long after his retirement, he co-authored an EPI report dispelling the myth that Social Security, which must operate in long-term balance, was driving our nation into debt. Although he was in weakening health, he was determined to defend the program he had devoted his career to. And though he was not the type to flaunt his achievements, an important part of the story was that Social Security’s actuaries, far from being taken by surprise by the Baby Boomer retirement, increases in life expectancy, and other supposedly calamitous demographic trends that critics liked to suggest had crashed the system, had accurately predicted them years ago and dealt with them. What no one inside or outside Social Security had predicted was that wage stagnation, rising inequality, and the Great Recession would erode the program’s funding—problems that suggest entirely different solutions. Earlier this week, I estimated that up to half million (583,600) U.S. jobs are at risk due to surging imports of unfairly traded steel. A recent post by blogger Tim Worstall suggests that the number can’t possibly be that large because the steel industry employs only 150,000 people. But this misses the point—the risk to the steel industry goes far beyond the steel companies themselves, and the workers they employ. It also includes workers in iron ore and coal mines, in other manufacturing industries that support steel production, as well as lawyers, accountants, managers and other workers who supply services to the steel industry. All these jobs, 583,600 in total, are threatened by the flood of steel imports. Half of the 46 top steel companies in the world were government-owned, and they accounted for 38 percent of global production. Illegally dumped and subsidized steel products are stealing market share and jobs from domestic producers. Worstall claims that we should ignore unfair import competition because, “if we get cheaper steel then this makes us all richer.” He concludes that “the market price is the fair price” for imports. Responding to a similar question from a reporter this week, Ohio Senator Sherrod Brown said that this is “like arguing it’s OK to buy stolen TVs because they are cheaper.” Even a market economy needs rules to prevent cheating and unfair trade. Worstall claims that we performed “some very heroic calculations” in estimating the jobs at risk due to unfair imports. He goes on to claim that “what is being done here is to assume that… steel workers buy restaurant meals so waiters are employed…and so on.” But this is exactly what we did not do. A recent story from NPR’s Andrew Schneider, about a construction boom and skilled labor shortage in Texas, is missing some of the links needed to understand what is happening there and why. The elements are all there: the huge loss of construction jobs following the financial crisis in 2008, the energy boom creating jobs regionally even while construction employment nationally remains about a million and a half jobs lower than its peak, a decline in unauthorized immigration, and contractors grudgingly increasing pay to attract workers. The two missing links are the role of the construction owner, like Chevron, in crushing the unions that provide skilled journeymen in the construction trades, and a clear discussion of the wage levels needed to attract skilled workers from parts of the country the recovery hasn’t reached. The story says wages are rising in Texas, but from what to what? Are wage levels high enough to persuade a journeyman electrician from Michigan or Los Angeles to relocate to Houston? Or are they unreasonably low, given the scarcity of skilled workers and the years of training required to produce a journeyman? How do union wages compare with non-union wages? The story never says. Oil giants like Chevron can afford to have their construction contractors pay well for skilled work, but they resist. Organizations they fund, such as the Business Roundtable, have led a decades-long campaign to weaken or destroy the building trades unions that actually train the greatest number of skilled tradesmen. Chevron, Koch Industries, ExxonMobil and many other energy industry corporations fund the American Legislative Exchange Council and its legislative efforts to kill unions and eliminate labor standards. It’s hard to hear Chevron complain about a labor shortage when Chevron and other Fortune 500 companies themselves are a major cause. They don’t merely fight unionization, they also oppose the state and federal prevailing wage laws that protect construction wages from being driven lower and allow union apprenticeship programs to continue providing the best-trained workers. Schneider is wrong to suggest that community college vocational training programs are the long-term solution to the shortage of skilled labor in Texas. The real solution is to restore the power and reach of the unions, raise wages to attract more workers, and grow the only proven way to develop the necessary skilled labor—apprenticeship programs funded by employers and jointly administered by unions and employers. One of the most shocking findings from Heidi Shierholz’s, Will Kimball’s, and my research on young graduates is that inflation-adjusted wages for young female college graduates are lower today than they were in 1989. Average real wages for young female college graduates are currently $15.29, whereas 25 years ago they were $16.12 (in 2013 dollars)—a decrease of 5.2%. This is part of a wider trend of wage stagnation and decline since 1989 for both men and women. For all college graduates ages 21-24 (male and female combined), wages today are only 2.4% higher than they were in 1989. This growth was driven entirely by the prosperous economy of the late 1990s, when young grads of both genders saw wage increases of close to 20%. Outside of that time period, however, wages have stagnated or declined, with women seeing especially large declines in the 2000s. 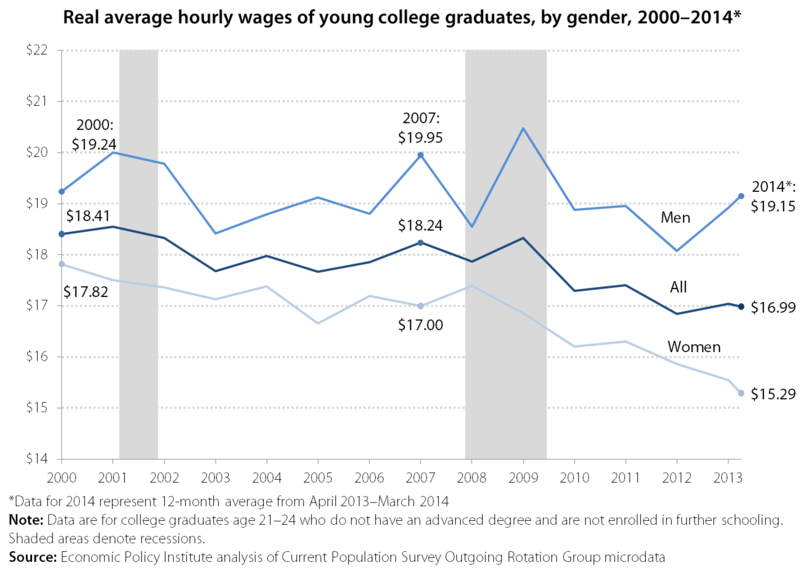 The figure below illustrates how the weak economy since 2000 has disproportionately hurt young women college grads’ wages as compared to men’s. Although women saw wage gains in the 1995-2000 period of strong economic growth, women’s wages have declined by 14.2% since 2000, with most of that loss in the period since the start of the Great Recession in 2007. 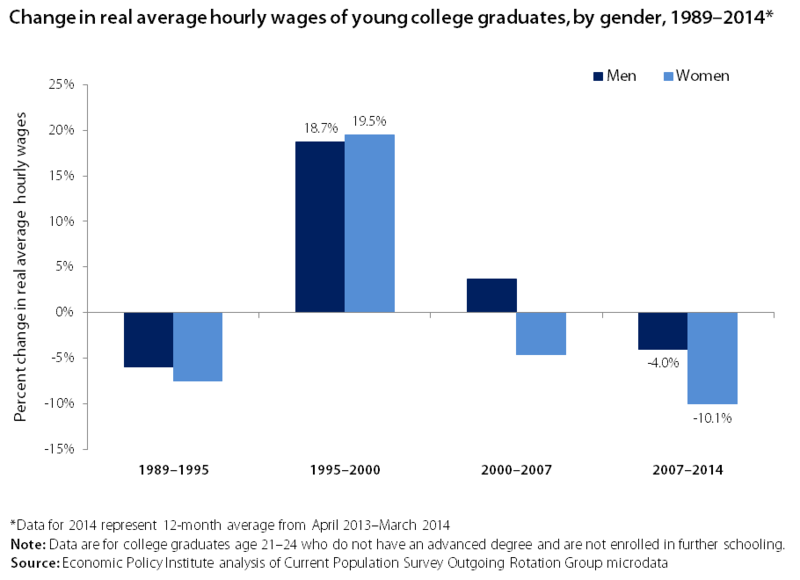 In fact, since 2007, young women college grads have seen their wages fall 10.1%, while men’s wages declined 4%. Our research showed that young college graduates’ fates are closely tied to the fate of the overall economy. The current weak labor market not only makes it difficult to find a job, but it also means that there is no need for employers to increase wages, as it is easy to keep the workers they need at lower wages when workers have no other options. If we want to reverse the wage losses that occurred due the Great Recession, we need to invest in our economy in ways that will boost aggregate demand and spur job growth, which will in turn improve wage growth for workers with jobs. Last Thursday, the Alum Rock school district, part of metropolitan San Jose, California, voted to reject a charter school application from the Rocketship chain of schools. As I detailed in a recent paper, Rocketship’s model, which relies on cheaper, inexperienced teachers and completely replacing teachers with computer applications for a significant part of the day, is being promoted for poor urban children, but is dismissed as inadequate by more privileged families. Rocketship is based in the San Jose area, and thus the Alum Rock rejection represents a rebuff in the part of the country with the most first-hand experience of their methods. While Rocketship proposed to serve students from schools that had failed to make Adequate Yearly Progress under the federal No Child Left Behind Law, its application failed to mention that nearly all of Rocketship’s San Jose schools have themselves failed to make Adequate Yearly Progress for at least two years in a row. Rocketship’s statement to investors proclaimed that “no assurance is given” that Rocketship schools will make Adequate Yearly Progress in future years. Because Rocketship students spend a large portion of their day in computer labs with no licensed teacher, 4th and 5th graders will not receive the minimum instructional hours required by law. Lynn Williams—president of the United Steelworkers of America from 1983 to 1994—died on May 5 at the age of 89. Lynn was an extraordinary union leader—smart, compassionate, and a visionary. His strength and creativity helped protect and expand his union through the crisis years of mass layoffs, bankruptcies, and industry consolidation. He was also an enthusiastic and loyal supporter of EPI from the very beginning. I first met Lynn in the mid-1970s when he was USWA’s Secretary-Treasurer. I was involved in an effort to revive a shut down steel mill in Youngstown, Ohio under worker and community ownership. The Steelworkers in Youngstown were of course totally supportive, but there was skepticism and even some hostility from the international union in Pittsburgh. But Lynn saw something important in the effort, and he helped steer me through some political land mines. The Youngstown project failed, but the idea did not. And when Lynn became union president he aggressively and successfully used worker ownership—including seats on company board of directors—to negotiate agreements that kept at least 25 steel companies from disappearing. Today (or possibly tomorrow) the House of Representatives will vote on H.R. 4438, which would permanently extend and expand the research and development tax credit. But unlike every other piece of legislation sponsored by the House GOP, this bill does not offset the $156 billion 10-year price tag. Apparently, tax cuts for corporations are such a high priority that passing them does not require the sacrifice elsewhere in spending or taxes that the House GOP demands for every other fiscal change. This flies in the face of everything the House GOP has done in this Congress. Last month, for example, House Republicans themselves passed a budget resolution that required offsetting with other revenue measures any tax extenders that were made permanent. H.R. 4438 will cost 15 times more than the proposed extension of emergency unemployment benefits, which House Republicans insist be offset. And it is more than double the discretionary funding increases in the Bipartisan Budget Act of 2013, all of which were offset. President Obama has rightfully issued a statement that he would veto this bill if it passes. House Republicans are making their priorities clear by rushing to make business tax cuts permanent without offsets and calling for raising taxes on millions of working families and students by letting important improvements to the Earned Income Tax Credit, Child Tax Credit, and education tax credits expire. Not to mention failing to reverse the cut-off of extended unemployment benefits at a time when long-term unemployment remains higher than it has ever been in the past when extended benefits were ended. If the House GOP were truly concerned about long-term fiscal challenges, then they would offset tax breaks by permanently closing other tax loopholes. The best way to identify a tight labor market, let alone a market beset by actual labor shortages, is to examine wages. Basically, if wages aren’t rising, the labor market isn’t tightening; if they don’t rise strongly, there are no shortages. As Adam S. Posen and David Blanchflower argue in a recent paper, if wages aren’t rising, it’s a sign of labor slack, weak demand, and a weak economy. So what’s happening in residential construction? The Wall Street Journal describes a frenzied search for skilled labor, causing pay to soar “to boom-time levels and beyond.” While it’s true that construction wages have risen over the past two years, they’ve risen from such a deep depression that they are still well below the levels of 2009. 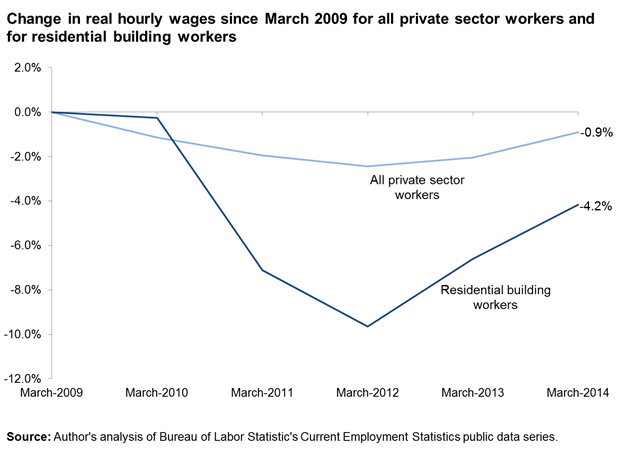 In fact, the real hourly wages of residential building workers are still 4.2% below 2009, a loss significantly deeper than that of the overall private sector workforce, whose wages are 0.9 percent below 2009. Today’s jobs report was, to say the least, strange. The first look was exciting—288,000 payroll jobs added! Now that is the kind of job growth that would get us back to a healthy labor market relatively soon. If we were to keep up this pace, we would get back to pre-recession labor market conditions by the end of 2016. Even I could live with that. The second look was good, too—the household survey showed the unemployment rate plunged to 6.3 percent. But I should have stopped looking there, because the rest was pretty bad. It turns out the drop in unemployment was entirely due to people dropping out of the labor force. Employment in the household survey actually declined, and the labor force participation rate fell back down to its lowest point of the recovery. Our estimate of the number of “missing workers” (workers who are not working or actively seeking work but who would be if job opportunities were strong) increased to an all-time high of 6.2 million. If those missing workers were in the labor force looking for work, the unemployment rate would be 9.9 percent instead of 6.3 percent. So this was one of those cases where the two surveys were telling completely different stories—the establishment survey was strong, the household survey was weak. As always, when the two surveys tell different stories, the rule of thumb is to place much more weight on the payroll survey, since it is larger and less erratic. But the weak household survey certainly dampens the fun of the payroll survey. If the economy really were entering a new stage of much stronger job growth, I’d expect both surveys to regularly be posting strong gains. That was far from the case in April. Today’s jobs report brings some positive news to balance the disappointing first quarter estimates of GDP growth (a meager 0.1 percent) announced earlier this week; there were 288,000 jobs added in April. At the same time, the unemployment rate fell to 6.3 percent, but this decline was entirely the result of people leaving the labor force, not people finding work. While all major race and ethnic groups experienced a similar pattern of declining unemployment rates and labor force participation rates in April, there are some interesting insights into the upward trend in the black-white unemployment rate gap to be gained from today’s numbers. As unemployment rates have gradually declined over the last four years, the black-white unemployment rate ratio has been increasing and is currently higher than it was before the recession, meaning that there’s been less improvement in the black unemployment rate than the white rate. Indeed, the African American unemployment rate remains 3.3 percentage points higher than the 2007 average while the white unemployment rate is just 1.2 percentage points higher than in 2007. Further, when we look at the difference between the current and 2007 employment-population ratios, we find that the decline in the share of employed working age adults in the population was greater for African Americans (down 4.6 percentage points) than for whites (down 3.9 percentage points). After a few months of the labor force participation rate (LFPR) showing what was hopefully early signs of strength, it dropped back down to its low of the recovery in March. The biggest drops in labor force participation in March were among young workers; the LFPR of workers under age 25 dropped 1.3 percentage points, from 55.6 percent to 54.3 percent. (However, these series are erratic due to small sample sizes, and the April decline in the under-25 LFPR was simply a reversal of its jump up in March.) The biggest drop in LFPR in April was among men under the age of 20. To my knowledge, data on unemployment insurance exhaustions by age don’t exist, but it is unlikely that young workers are a big proportion of exhaustions. This means that the April drop in labor force participation is likely not being driven by the expiration of federal unemployment insurance benefits last December as some have suggested, but simply by the weak labor market. There is currently an all-time-high of 6.2 million missing workers (potential workers who are neither working nor actively seeking work due to the weak labor market). Almost a quarter of them (1.4 million) are under age 25. The figure below shows that the unemployment rate for young workers would be 18.4 percent instead of 12.8 percent if the missing young workers were in the labor force looking for work and thus counted as unemployed. For a complete picture of the labor market prospects facing the new cohort of young adults graduating from high school and college this spring, see the Class of 2014 report released yesterday. It includes, for example, a detailed discussion of the finding that there is little evidence that today’s missing young workers are “sheltering in school”. Are Today’s Minimum Wage Workers Worth Less? Sen. Mike Enzi (R-WY) is a nice, older man who remembers the years of his youth with a golden glow. His father owned a shoe store, so Enzi had a comfortable life. He went to college and eventually took over his dad’s business. He says he was paid the minimum wage when he started out as a “stock boy,” so he ought to have some empathy for minimum wage workers today, many of whom don’t have business owners for fathers and have to support themselves and other family members, as well. But instead, Enzi voted against raising the minimum wage in the U.S. Senate yesterday. In fact, he voted against even bringing the issue up for debate. He doesn’t think today’s minimum wage workers are worth as much as he was. Back in 1963, when Enzi was 19, the minimum wage was $1.25, which would be $9.65 today. Enzi doesn’t want to debate a bill to raise the minimum from $7.25 an hour, apparently believing that he was worth $2.40 an hour more than today’s minimum wage workers, many of whom are in their thirties, veterans, or parents. More than 40% of those who would benefit from an increase to $10.10 an hour have been to college and have more education than Enzi did when he earned the minimum wage. Why doesn’t Enzi think these workers are worth as much as he was? As Paul Whitfield reports in the Los Angeles Times, Sen. Enzi says today’s workers “don’t know how to interrupt their texting to wait on a customer.” Really? More than half of the workers who would benefit from a raise to $10.10 an hour are over 30, and more than 1 in 10 are at least 55 years old. Whether from scorn or simple lack of empathy for their fellow citizens, Enzi and his fellow Republican senators who have voted against helping the long-term unemployed, voted to cut families off food stamps, or voted to deny workers an increase in the minimum wage to the level of purchasing power Enzi received 50 years ago are consistent in pulling up the ladder of opportunity after climbing it themselves—or after having been set at the top by family circumstances. From way up there in the one percent, the people at the bottom apparently look undeserving. Last week EPI published the report Do Poor Kids Deserve Lower-Quality Education Than Rich Kids? Evaluating School Privatization Proposals in Milwaukee, Wisconsin, authored by University of Oregon associate professor Gordon Lafer, an EPI research associate. The paper includes a detailed examination of a “blended learning” model of education that replaces teachers with online learning for part of the school day, long a source of controversy in education policy debates. This approach is exemplified by the Rocketship chain of charter schools, which is being promoted for expansion in Milwaukee. EPI maintains the highest standards of rigorous research, and this report is no exception. Dr. Lafer’s description of Rocketship’s model was largely based on Rocketship’s own corporate documents, which were cited repeatedly in the report. In addition, the author interviewed Rocketship representatives both in Milwaukee and at the company’s national headquarters, including several top executives. After the report was published, the author emailed a copy to Rocketship executives, inviting their comment and specifically asking them to identify any particular facts in the report they might believe to be incorrect. While Rocketship responded by issuing a statement denouncing EPI’s report, the statement is a recitation of talking points rather than a rebuttal of the report’s rigorously researched and meticulously documented findings. Indeed, the company has not identified a single inaccurate fact in the report. Further, neither this report nor EPI as an organization is opposed to charter schools per se; indeed, the report concludes with proposals for accountability standards that would allow charter schools to function on an equal footing with public schools. 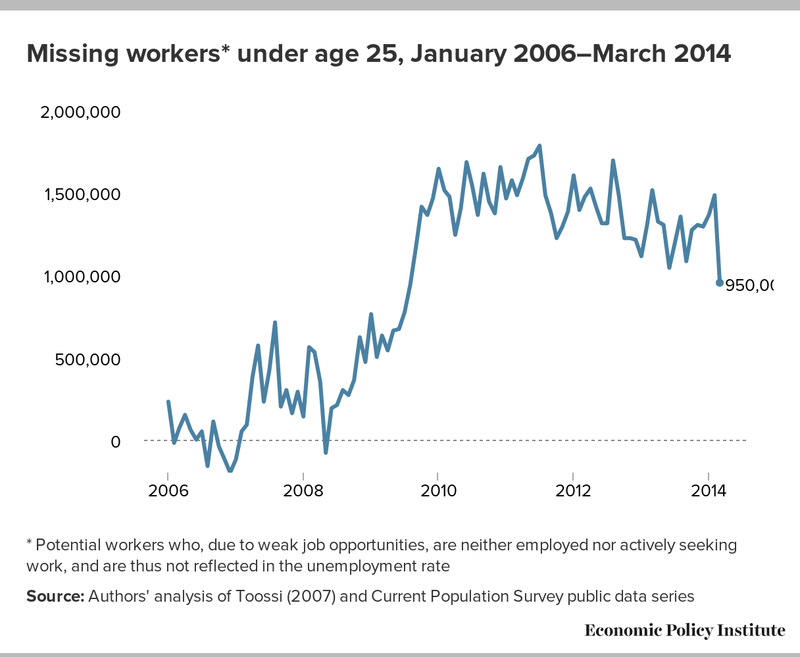 What to Watch on Jobs Day: Will the Number of Missing Young Workers Decline Again? There are currently nearly one million “missing workers” under the age of 25. (In total, there are 5.3 million missing workers, who are neither working nor actively seeking work due to the weak labor market.) In March, the total number of missing workers dropped substantially, due almost entirely to an increase in the labor force participation of workers under the age of 25, particularly men. It turns out that the March increase in labor force participation of young men simply partially reversed a five-month slide, and their labor force participation remains far below its long-run trend. However, what happens with the labor force participation of young men in April will help clarify whether the March increase was a real step in the right direction or just a one-month fluke in a volatile series. The figure below shows the number of missing young workers (men and women combined). There is a great deal of volatility month-to-month, so looking at the long-run trend is crucial. The number of missing workers under age 25 shot up to 1.6 million between early 2007 and early 2010, and then fluctuated around that level for a year-and-a-half, before declining to its current level of 950,000 (580,000 men and 370,000 women). I should note that this calculation takes into account long-run trends in labor force participation, such as lower labor force participation of young people due to increasing college enrollment over recent decades. (The methodology for calculating the number of missing workers is described here.) But it is also true that today’s missing young workers have not been able to “shelter in school” from the labor market effects of the Great Recession. Increases in college and university enrollment rates between 2007 and 2012 were no greater than the increases seen before the recession began—and since 2012, college enrollment rates have dropped substantially. This is discussed in more depth in my latest paper, on the class of 2014. Earlier today, House Budget Committee Chair Paul Ryan (R-Wis.) continued his study of poverty with a hearing entitled, “A Progress Report on the War on Poverty: Lessons from the Frontlines.” Featuring witnesses from several poverty-fighting non-profits, Rep. Ryan styled the hearing as a “listening exercise” to hear about the strategies these charities and non-profits use to help alleviate poverty on the local level. While it is admirable that Rep. Ryan gave a platform for community leaders to share their stories, he seems to have no sense of the scale of the problem before him. Indeed, Rep. Ryan’s veneration for the work of private charity is quite the contrast with his opinion of the federal government’s anti-poverty programs, which he has disparaged as “duplicative,” “complex,” and “ineffective.” However, for as much good work as it does, private philanthropy has well-known biases, as charitable donations tend to flow disproportionately to more glamorous causes, and often dry up during business cycle downturns—just when they’re needed most. In short, while individual charities and non-profits do incredible work to help our communities, they lack the ability to create widespread change; only the federal government has the resources to help alleviate poverty at the scale that is required. Today’s GDP report was, not to get too technical, just crummy nearly across-the-board. Consumption spending was up, but the personal savings rate fell, meaning that the increased consumer spending was not financed by good wage and income growth, but by reducing savings. Exports fell sharply (hard to blame on bad U.S. weather) while most categories of investment fell as well. Core price deflators also ticked down again, signaling that economic slack is surely not shrinking. One of the only bright spots in the report was that government spending is shifting from a large drag on growth to roughly neutral. This is what qualifies as decent news in today’s low expectations economy, I guess. We’ve tried to illustrate the historically large drag that austerity has put on the current recovery, in a bunch of ways. Here’s another try. The figure below shows the simple percentage point contribution to GDP growth from government spending. Two things stand out. The tentative deal reached between Detroit Emergency Manager Kevyn Orr and the Detroit pension funds has been characterized in the New York Times and other news reports as a victory for workers and retirees. This is true only in the sense that much worse cuts had been threatened. The confusion stems from a tendency to treat cost-of-living adjustments (COLAs) as icing on the cake rather than necessary for subsistence, when in fact workers would be better off with equivalent across-the-board cuts than an erosion in the real value of benefits. COLA cuts take a bigger bite as retirees age and face dwindling savings and higher out-of-pocket health costs (exacerbated, in this case, by proposed cuts to retiree health benefits). The deal would initially cut the pensions of general employees by 4.5 percent and eliminate these workers’ 2.25 percent annual COLA. Police and firefighters would see no initial cuts and would retain a 1 percent annual COLA. Though the uniformed services face a smaller cut in percentage terms (a reduction of roughly 15 percent in real lifetime benefits as shown in the table below), they lose more in dollar terms because they tend to retire younger and have larger pensions. Because Detroit police and firefighters aren’t covered by Social Security, their real incomes in retirement may be nearly as affected as those of general employees, who face larger cuts in percentage terms but at least will receive inflation-adjusted Social Security benefits. The House Ways and Means Committee plans to mark up six bills tomorrow that would make six temporary tax breaks—part of an annual tax extenders package—permanent. The justification being given for making these provisions permanent is they will “help businesses grow the economy and create jobs.” The resulting permanent increase in budget deficits, however, could eventually reduce economic growth and job growth if the debt-to-GDP ratio becomes large enough. More importantly, two of the provisions cannot be said to boost even short-term economic growth. The CFC look-though rule (H.R. 4464) and the active financing exception (H.R. 4429) help multinational corporations avoid paying U.S. taxes and create incentives to move jobs and investments overseas. Making these two tax provisions permanent would eliminate jobs and increase budget deficits by $80 billion over the next 10 years. The six tax provisions that Chairman Camp wants to make permanent are part of a group 50 to 60 temporary tax provisions that are routinely extended for another year or two, and which typically reduce tax revenues by about $100 billion over 10 years. Like other temporary measures, such as extending unemployment insurance for unemployed workers during times of weak labor demand, the budget cost of the tax extenders package is rarely offset. (Mr. Camp notes that paying for the tax extenders package “is not consistent with recent practice by Congress.”) But the House GOP is now demanding that a temporary extension of unemployment insurance (budget cost of about $10 billion) be fully paid for, but not the permanent extension of selected tax extenders (budget cost of $310 billion). With this markup, committee chairman Dave Camp appears to have morphed from a serious legislator trying to piece together a revenue-neutral reform of our byzantine tax system to a politician who talks out of both sides of his mouth—he supports fiscal responsibility but is proposing to make six temporary business tax breaks permanent and in doing so increase federal deficits by over $300 billion over the next 10 years. If he were truly concerned about long-term fiscal challenges, he would offset these tax breaks by permanently closing other tax loopholes, and he would not be working to make provisions that kill jobs a permanent part of the tax code. Today is Workers Memorial Day, a day of remembrance for the thousands of workers who die on the job each year, and the tens of thousands whose lives are shortened by illness or disease contracted at work. It’s easy to see the dangers of construction work, or to imagine why logging would be the single most dangerous occupation. But farm work is far from most people’s minds when it comes to dangerous work. It turns out that that’s partly because so little is reported about the dangers, either to the media or to government agencies. New research, published in the April issue of the Annals of Epidemiology, finds that approximately 77 percent of non-fatal occupational injuries and illnesses in agriculture go unreported. Such a large undercount likely results in fewer private and public resources devoted to ameliorating agricultural safety and health threats. The Bureau of Labor Statistics’ annual Survey of Occupational Injuries and Illnesses (SOII) estimates the number and types of nonfatal injuries and illnesses within and across all industries. Injuries include fractured bones, lacerations, severed body parts, and head trauma; illnesses include asthma, chronic obstructive pulmonary disease, and cancer. The SOII estimated there were 19,700 injuries and illnesses for crop farms and 12,400 for livestock farms in 2011. My colleagues and I estimated that the numbers of cases was actually 74,932 and 68,504, respectively, which means the SOII undercounted by 74 percent and 82 percent. We ask a lot of our armed forces. They serve our country in some of the most dangerous environments and difficult situations faced by any American. Yet having endured those experiences, too many veterans returning to civilian jobs find themselves in work that barely pays enough to live on. In fact, of the roughly 10 million veterans working in America today, 1 in 10—that’s one million veterans—is paid wages low enough that they would receive a raise if the federal minimum wage were increased to $10.10 per hour, as proposed in the Fair Minimum Wage Act of 2013. In this recent post, I pointed out that after increasing for decades, college enrollment rates have dropped since 2012. The data in that post are college/university enrollment rates for people age 20-24—I used those ages because they are very easy to get from the BLS site. This morning, BLS released their annual report on college enrollment and work activity of recent high school grads. The figure shows college enrollment of recent high school graduates (specifically, it’s the college enrollment rate in October 2013 of people age 16-24 who graduated from high school earlier the same year). The data are volatile year to year, but they show that college enrollment of brand new high school graduates has been dropping since 2009. This is a worrisome trend, particularly to the extent that it is due to students being unable to enter college because the lack of decent work in the weak recovery meant they could not put themselves through school or because their parents were unable to help them pay for school due to their own income or wealth losses during the Great Recession and its aftermath. Falling college enrollment indicates that upward mobility may become more difficult for working class and disadvantaged high school graduates. In a couple weeks, we will release our annual “Class of …” report, which will detail the labor market prospects of new high school and college graduates. (Here is last year’s report.) In this report, we investigate the drop in enrollment, including the fact that dropping enrollment rates at a time when employment is not increasing very strongly means that a larger share of young people are “disconnected”—i.e. not enrolled and not employed. This represents an enormous loss of opportunities for this cohort that will have long-term scarring effects on their careers. EPI was lucky enough to co-host the first American event for Thomas Piketty to discuss his new book Capital in the Twenty-First Century (video from the event is online if you missed it). Piketty’s book is getting justly deserved praise, and his work suggests a dizzying array of political and policy implications. Chief among them is something that remains surprisingly controversial, even among those genuinely concerned with the rise in American inequality: the idea that ameliorating this inequality and providing decent living standards growth, for the bottom and middle requires braking income growth at the very top. The logic is pretty simple: given overall income growth, more income being claimed by the very top must necessarily come at the expense of families at the bottom and middle. So, when the top 1 percent’s share of income doubled between 1979 and 2007, this meant that there was much less room to provide income growth to the bottom and middle. The objection to this logic is, of course, that income growth is not given, and attempts to steer more income growth away from the top and towards the bottom and middle would have just led to slower overall growth. But there are plenty of reasons to doubt this. Let me start with an appeal to authority: Piketty put it pretty bluntly in the EPI/WCEG event yesterday, saying “we don’t need 19th century inequality to generate 21st century growth.” And, appealing to the same authority, but this time relying on empirical evidence, Piketty and co-authors have shown that cutting taxes for the top 1 percent actually increases their own pre-tax income growth and reduces income growth at the bottom. Every year on Tax Day, there are always jokes about death and taxes, and questions on which one is preferable. (For example, recall the character in the Hitchhiker’s Guide to the Galaxy series—Hotblack Desiato—who spent a year dead for tax purposes.) Almost no one, however, talks about the group of taxpayers who worry about neither death nor taxes: corporations. By the end of the day, almost every individual taxpayer will be reminded of the certainty of taxes (while death has been postponed for another year). 30 percent of taxpayers fall into the 15 percent tax bracket. They can expect to pay about $3,000 in federal income taxes, on an adjusted gross income of almost $50,000. (This does not count the all the other taxes paid such as Social Security payroll taxes and state and local income taxes.) These taxpayers face a 15 percent statutory tax rate and paid a bit over 6 percent of their AGI in federal income taxes.